Keith Melton Vs Moira Rogers ROUND ONE! In all honesty, this is really just about me and the Bree half of Moira Rogers going toe to toe. The Donna half of Moira Rogers is really very nice except for that time she told me to die in a fire. She fights battles against evil corporate ISPs and feeds orphans. Bree, on the other hand…well, I’ll get to that. If you’ve never read Moira Rogers, what’s wrong with you? Honestly. Her werewolves scorch the pages. Very cool stuff, both the Red Rock Pass series and her Southern Arcana series. I have a soft spot for her character Mackenzie. She also has about a billion other books out that I haven’t read, but if I list them all we’ll be here all night. Anyway, if you haven’t figured it out yet, Moira Rogers consists of the incredible super dynamic writing duo of Bree and Donna. One of them hacks databases. The other launches wild pigs through the air with trebuchets. Or so I heard on the internet, I swear. Regardless of their personal hobbies indulged while not writing, I’m here to detail a bit of the vaguely infamous throwdown that happened the other day on the magical social networking paradise of Twitter. For those of you who are dead, Twitter is a place known for brevity, wit, and a huge whale lifted by ropes by a bunch of annoying birds. But I digress, as usual. 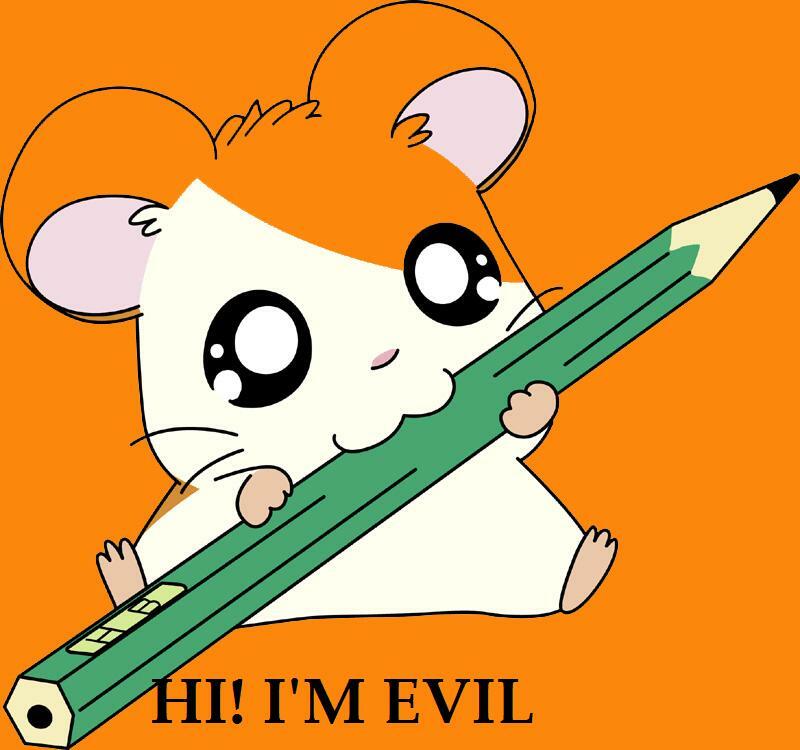 The altercation started when I realized, much to my shock and awe, that Hamtaro might just be one of the most frighteningly disturbing things I’d ever seen. Watch this clip, but be warned. You cannot UNSEE it once you’ve subjected your eyes to its Hyper Evil Cuteness. Alas, after suffering yet another unprovoked @moirarogersbree insult (this one about how my face would look better hidden by a mullet and then backed over by a tractor — I’d link to it directly but there are small children on the internet, God help them all) I felt it incumbent upon me to fire back with both metaphorical barrels. Thus, I drew the comparison (admittedly shaky) between Moira Roger’s shapeshifters and the fell creatures of Hamtaro the hamster anime. I’m happy to say nine out of ten of my fellow internet monkeys agreed with me. Ah, Sesame Street. You bring back such joyous memories. Memories of obsessively counting vampires, trench coats, and…lightning in elevators. Now, notice how the Count actually bounces Kermit out of the elevator as if he were an obnoxious drunk slurring his profanity at some posh club. I find this line of work entirely plausible for my vampire. Hey, times are tough all over. Unfortunately, since I’m male and need to keep score, I’m going to have to arbitrarily award this round to me on points. So, Keith wins round one. You may proceed to launch fireworks and kiss babies in joyous celebration. You can also find them all over the place on Amazon and Fictionwise, but you’ll have to do the legwork. Oh yeah, here’s a poll so we can make my victory all statistically valid. So Teagan at the BookWenches review site was kind enough to give me an interview. Only later did she realize how much she’d come to regret allowing my answers to her questions into a public forum. My first book has just released in print. It goes without saying I’m extremely excited. But I’ll say it anyway. I’m extremely excited…and today it’s not just those three cups of coffee I had. The book is beautiful. I’m biased, of course, but I really love everything about it. Front cover. Back cover. Color scheme. I really loved working with Samhain. Good people. Anyway, back to the point. 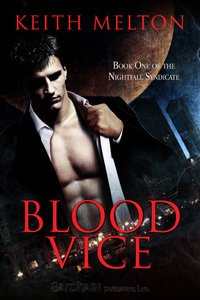 Blood Vice in print for everyone who prefers print books.